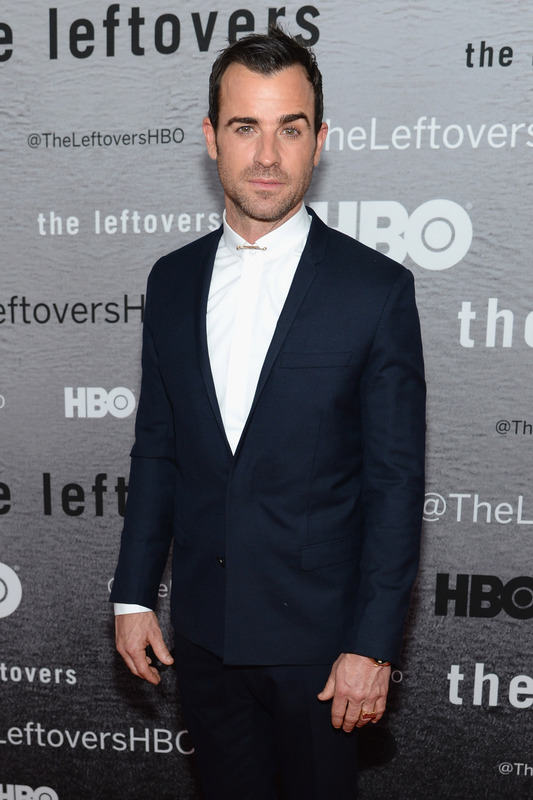 How do I love Justin Theroux? Let me count the ways... Well, for starters, he's a big old slice of babe pie with extra cheese and the works. (With a side of bulge.) But looks aren't the only thing he has going for him. Justin Theroux is profiled in July's Elle magazine and I don't know about you, but I'm happy to devote more of my waking minutes to learning more about this multifaceted man. In the issue, he talks about playing the starring role in The Leftovers , as well as being Jennifer Aniston's other half (whom he is gloriously, ultra-cheesily enamored with). Despite the fact that Aniston may be the more recognizable member of the couple, Justin has solidified himself in our hearts after a long, eclectic Hollywood career. Plus, has there ever been a hotter TV cop? Beyond his performance as Kevin Garvey, the hot-tempered and morose police chief who is trying to maintain his sanity post-rapture, Theroux has had a long Hollywood career. Even if this is his first leading man billing, he's been around for years. In middle school, I developed a huge crush on him after getting to know him as Joe, Brenda's brief boyfriend on Six Feet Under. It's essentially impossible not to fall in love with him. So, in lieu of this Elle interview, in which angels sing when he speaks, I was inspired to compile a list of all the reasons to love Justin Theroux. He's a great comedy writer. No joke, Theroux has comedy chops. Along with Ben Stiller and Etan Cohen, Theroux wrote the screen play and developed the story for Tropic Thunder. He’s also slated to write and direct Zoolander 2. In the Elle article, he talks thoughtfully about writing comedy, and the strictures you come up against while trying to create art. There’s a certain point where political correctness becomes extremely conservative and it skews to a point where it becomes humorless... You have to be sure of what your target is, who the joke is on. When he was younger, he was a real live Bohemian! Theroux graduated from Bennington in Vermont, moved to New York and became a regular slashie. His particular combo was actor/bartender/visual artist. He painted his own artwork in murals and clubs around the city for a while. Is there anything he can't do? He comes with Amy Sedaris’ seal of approval. Uproariously funny lady Amy Sedaris is counted amongst Theroux's many fabulous and funny friends. In the Elle article, her opinions on Theroux will make you yearn for a group hug with these two amazing human beings. Justin’s got this dark side — he’ll go there… but more than anyone I’ve ever met, he just really does blossom with sunshine. Justin is like a girlfriend. He’ll do girly things with you: He’ll tan, he’ll put your makeup on for you, he gives great advice. He will get pedicures with you on spa day. Speaking of being one of your girlfriends, he’s down for girls’ day activities. He's particularly game for painted toenails. Nobody plays a better evil DJ. Yep, the nefarious record slinger in Zoolander? That’s Justin. Few Adonis-like individuals are better at popping up in huge movies undetected. Not many folks can slick their hair back like him. Did you notice him in American Psycho? Check out his business card. He was even in War Horse. Don't you just wish you could squeeze him all the time? Sadly, that's Jen's job. Welp, I can't say that she doesn't deserve it.